Super OMEGACLAD™ XL Probes are an excellent choice for high temperature measurement. They provide very low drift at high temperatures as compared to conventional Inconel and Stainless Steel sheathed probes. They are available in both K and N thermocouple calibrations. Omega offers probes in a variety of styles. See the Related Links section at the bottom of this page for addtional models. 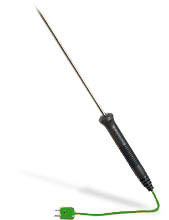 Probes are available in 150, 300, and 600 mm. 150 and 300 mm probes are priced the same. Contact Sales for prices on additional lengths. ** Specify length in millimetres (150 mm, 300 mm, or 600 mm. SUPER OMEGACLAD™ XL sheath, 6 mm O.D., grounded junction, 300 mm length, supplied with a miniature thermocouple plug.